Think of your favorite character from a game, book, or movie. What makes them memorable? It’s not their Strength score, or how many hit points they have — it’s who they are as a person: what they look like, how they act, their personality, and what drives them. Using a simple but powerful template that features Appearance, Roleplaying, Personality, Motivation, Background, and Traits, Masks provides the core elements of a thousand great characters. Masks NPCs are designed to be used on the fly, no prep required — but with enough depth to be used when planning adventures, as well. Like all Engine Publishing titles, Masks includes four versions of the book: DRM-free, bookmarked, hyperlinked PDF plus EPUB, MOBI, and plain text. 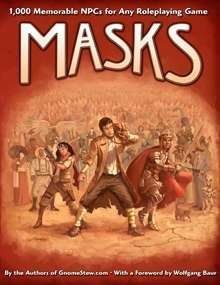 Want to learn more about Masks? You can download a free 17-page PDF excerpt of the book (including 18 ready-to-use NPCS) and read more reviews on the Engine Publishing website. Need plots to go with your NPCs? Check out Eureka: 501 Adventure Plots to Inspire Game Masters, which makes a great companion to Masks. You can also buy both books in a bundle for 20% off: Ultimate Game Master's Toolkit: 501 Plots and 1,000 NPCs.